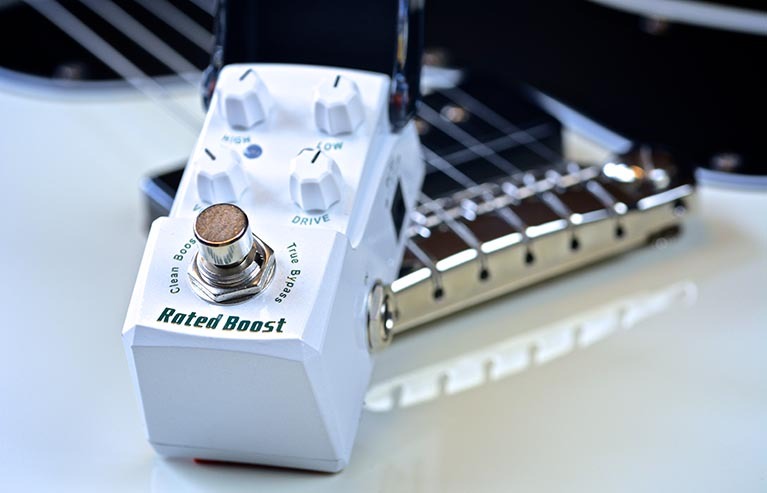 The Joyo Rated Boost JF-301 is part of the highly rated JOYO Ironman series, well built tiny tone machines that are guaranteed to surprise with their sound quality and affordability. The Joyo JF-301 Rated Boost is here to push your amp to beautiful overdriven overtones while maintaining your guitar's inherent natural sound. Dial in crystal clear volume or add a little dirt and EQ to take it up a notch for your tasty solo. One special feature of the Ironman series is the cover that flips over the controls to protect your carefully dialed in settings from getting changed accidentally. Set it and forget it! A nice little bonus is the LED light glows through the cover when engaged for a cool visual effect. Took a gamble and bought this today at the North East Guitar Show. Wow ! Does exactly what it says on the tin and has got me interested more in this range. Simple to set up, I use this through the effects loop on a Blackstar HT Club 50w and it sounds massive. Thanks to the guys at the show for the advice really helpful, spot on.